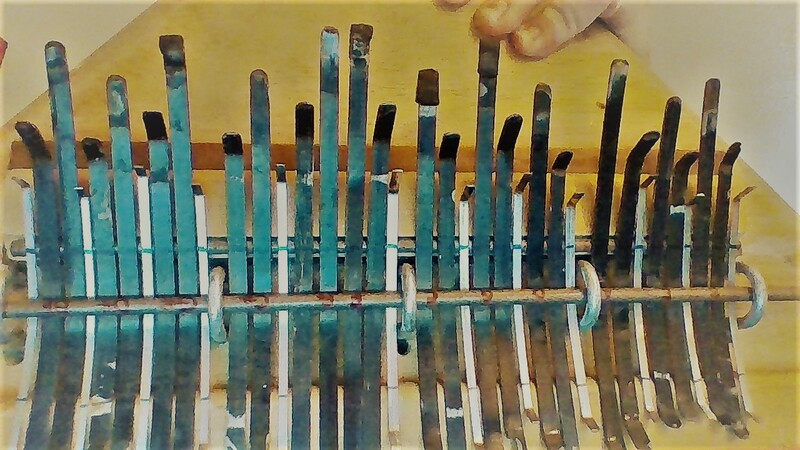 building a Mbira, which is like a Kalimba with 3-4 chromatic octaves with bigger tines. I'm getting away from wood because of expense. 3D printing is cheaper, gives more control, and saves time. The range will be F2 -- E5; Does not appear I can control density (website talks a lot of about thickness, and its affect on strength ). It's vegetable oil derived plastic: density is 990 kg/m³. which has a minimum of 0.8 mm thickness, ( https://www.sculpteo.com/en/materials/black-plastic-material/#informations-generales-plastique) One side of the top will need to handle the weight of the bridge which includes the tines and tensioning rods, the mount for the bridge will need to be a minimum of 510 mm by 110 mm and will be about 8 lbs, to accommodate the size of the tines. The range will be F2 -- E5. What are my ideal dimensions? I's not even close to that simple, unfortunately. The reason people use wood is for strength, resonance, and durability. If you try to use PLA to print parts, you'll find out about its sensitivity to moisture, solarization, and heat. There are other, much stronger materials, such as ABS or PETG, which might at least get you to parts with a reasonable lifetime and less probability of breakage. Unless you have access to a high-grade (expensive) extrusion printer, you won't be able to build something that large in the first place. Typical RepRap designs are limited to roughly 22 cm in any dimension. All in all, if you really can't find a chunk of scrap wood (gonna be cheaper than the filament you'd have to buy, I suspect), you probably should look into a molded part or a carbon-fiber layered design. Not the answer you're looking for? Browse other questions tagged theory instruments construction or ask your own question. Is a guitar body made out of mahogany generally lighter than a body made out of alder ? Is there a more specific name for this instrument than “PVC instrument”? Why is the back of a double bass's body cut in the middle? What instrument produces a triangle wave? Find the proper sound / instrument for background (layer)?